Joyful Hermit ordered some seeds this spring of herbs and flowers not so easily located. Amaranth is among them, although these seeds may be purchased in stores. Another name for it is: Love Lies Bleeding. This flower is also a grain, of which I did not realize until deciding to cook some from the bag of amaranth purchased a month or so ago. JH grew Love Lies Bleeding/Amaranth several years ago. These are fascinating plants, growing to 4-5 feet; but the “flower” heads droop down, rose-colored, looking like upholstery tassels more than the typical flower blooms. In fact, the blooms are masses of these tiny grains that eventually turn tan-colored when picked and dried. It is these tiny, tan grains that were cooked the other night, right in with some basmati rice. There are various ways to cook and eat amaranth, including popping it like popcorn! I assume they will be tiny kernals when popped due to their tiny little grains to begin with. 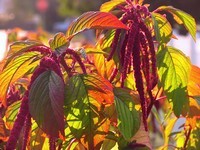 But amaranth may be cooked in water, simmered for 30 minutes, and eaten solo. It also may be used in baked items, or ground into flour itself. Amaranth was a staple food of the Aztecs and preferred grain of their royalty. Of all grains, amaranth has the highest protein content and is high in potassium, magnesium, calcium, vitamins A and E, lysine, fiber and iron. Cooking 1/4 cup of amaranth with 3/4 cups of water, we gain 7 grams of protein, 60% of our daily need for iron, and 8% calcium. 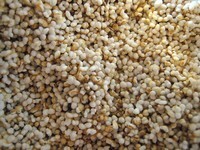 In researching this grain, amaranth is a complete protein, like soya. The flavor is mild, nutty, and has a nice texture with a touch of crunch. It is delicious with the basmati rice, and soon Joyful Hermit will try simmering it in some fruit juice or with raisins or other dried fruit with water, for a solid breakfast grain. Will let you know more about this joyfully healthy amaranth grain after experimentation. Also am going to see if the plants grown here in the gardens are able to be harvested. Why not? A 1 lb. bag of amaranth contains 9 protein-iron packed servings. JH paid $4.49 but am sure it can be purchased for less than this–and far less if the garden produces a good crop! This entry was posted in Gardening, Health Helps. Bookmark the permalink. It is a beautiful plant/flower, and I found a site that describes how to “winnow” the chaff from the grains in the flower heads and how to know it is time. They then can be dried in the sun for a day, stored, and eaten later. Very simple, really. We are having such downpours each afternoon that it is not quite the right time to plant the seeds, as I fear they will drown. But soon. Love Lies Bleeding is a gorgeous garden addition!